We all want to be healthy and, no doubt, you want the same for your children. Children are susceptible to many of the same stresses as adults, but early chiropractic care can help your child grow as healthy as possible. Starting chiropractic care early in life also helps correct problems before they become worse or more permanent, helping to avoid pain in adulthood. Chiropractic care is entirely safe for children. Adjustments are extremely light and gentle. Children don’t require the same amount of pressure to accomplish the correction as adults do. We use lighter force techniques, like Impulse® instrument adjusting and postural adjusting, to deliver their adjustments. Plus, children have an amazing ability to grow and heal quickly. 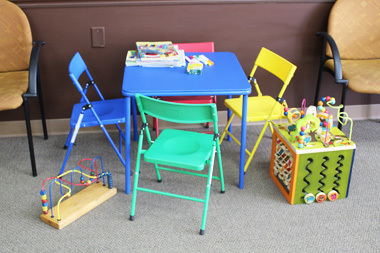 We even have a waiting area just for kids! In addition to developing good posture and proper balance, chiropractic has a number of other beneficial effects for children. One of the most important benefits is the development of a healthy nervous system. Since the nervous system controls every function of the body, proper function is critical. We are frequently asked how chiropractic care can help with common childhood ailments. Once you understand the basic concept of chiropractic and how the nerves radiate out from the spine, you’ll have a better understanding of how various functions can be disrupted by nervous system interference. For example, pressure in the upper cervical spine can disrupt the function of the nerves that lead to the ears, resulting in chronic ear infections. It’s vitally important that a child’s nervous system grows and functions as it should, yet the nervous system is often overlooked. Through chiropractic, kids become empowered and learn to look inside themselves to heal instead of looking to drugs and surgery to restore and maintain their good health. Want to learn more about how your child can benefit from chiropractic care? Contact our office. We’re happy to help!